At FARMAN Aero Training you dispose of a flight simulator, the exact replica of a Cessna 172 SP, piston single engine equipped with a Garmin 1000 avionics accompanied by the same instruments found in the plane. External visualization covers a visual field of 200 degrees giving more realism to the plane’s movements. This is the ideal tool to discover or perfect yourself with all available functions on the Garmin 1000. You will be working without the pressure of a real flight, all the while inhabiting a realistic environment which will allow you to fully enjoy the time spent operating the simulator. Moreover, several stalls and emergency situations can easily be simulated. It has been certified as a simulator with an FNPT2 by French aeronautical authorities equipped with a force feedback on the controls. It is ranked by US authorities AATD. It allows crediting 25H on a single-engine IFR EASA training or extend that same year qualification. 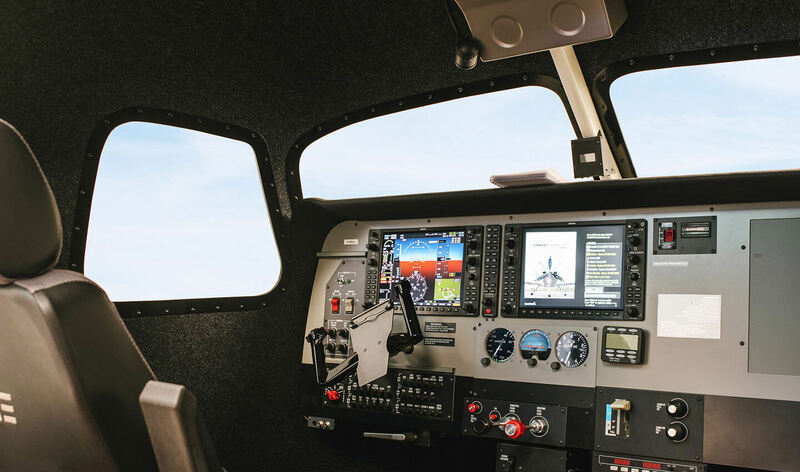 It also allows credit to 20H training for instrument flight qualification IFR FAA and maintain your IFR FAA by including in your logbook approaches made to the instruments. You can also easily prepare a future flight with a totally real support since data bases are kept up to date.